This assignment is narrative — meaning you are going to tell a story. Of course, there are many kinds of stories and deciding which kind to write might be a little overwhelming, so we have narrowed it down for you. Someone in danger — needing rescue. 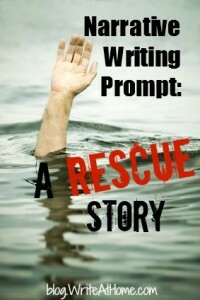 A rescuer — the hero who tries to save the day. Keep it brief. Sometimes it’s easy to get carried away in a story like this, so be careful not to go too long (stay under 1,000 words). Focus on the rescue, not the events leading up to it. Do your best to capture the reader’s attention and create suspense. Don’t be predictable. Try to surprise the reader. Below are some suggestions for rescue situations. You may choose one from the list, choose one and change it up, or create one that is entirely original. A tiger is trapped in a pit. An old fisherman is lost at sea after a storm. A bank robber is trapped in the vault he had been trying to rob. A rich man’s daughter is held captive by kidnappers. A lone mountain climber hangs off a cliff by his fingertips. A soldier in a bunker is surrounded by the enemy. A hamster is in a pet store cage. A vacationing family has run out of gas in the desert. A skier is buried under an avalanche. An astronaut’s tether has broken during a spacewalk. Make a blogger’s day: leave a comment below. The Oregonian reports that Oregon Partnership’s staff is stunned at the unusual surge in which they received five calls within two hours of people thinking about suicide. Let people read it, of course! I’ve had people suggest in the past that I provide some kind of venue for publishing stuff like this. It’s a good idea. I could run a story contest or just agree to publish the top three submission…something like that. I’ll give it some more thought. Do you think there would be interest? I post stuff like this regularly because lots of readers here are teachers and homeschooling moms who are sometimes looking for writing assignment ideas for their kids. If one *does* use the prompt, what should one do with it?